The Ship that Would Not Die. 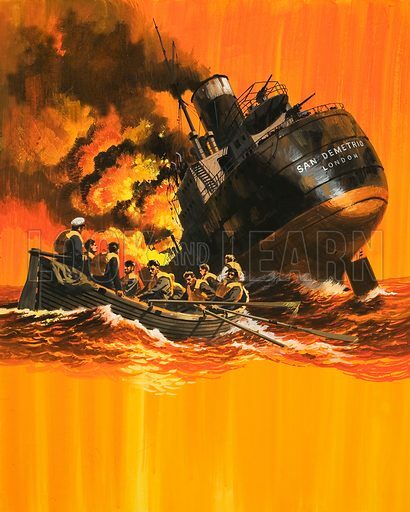 The San Demetrio, a tanker laden with petroleum, was attacked by the Germans in 1940. Although the crew abondoned the ship, they later found her still floating and, re-boarding her, managed to sail her to safety. The ship continued to provide good service until it was sunk by a torpedo in 1942. Original artwork for illustration on p33 of Look and Learn issue no 443 (11 July 1970).